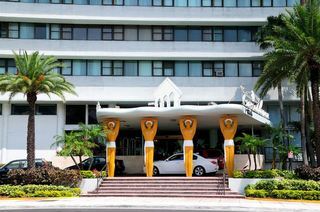 Overlooking the Biscayne Bay and the Atlantic Ocean, this comfortable hotel is located in the northern stretch of Miami Beach near several golf courses and parks. The chic boutiques of Bal Harbor are just ten minutes' drive from the hotel, and visitors might enjoy the fabulous nightlife of art deco South Beach, which can be reached in 15 minutes by car or 30 minutes with public transport. The hotel's cosy studio suites feature unlimited high-speed internet access, complimentary coffee, and kitchenettes with refrigerator, microwave, and dishes so that guests can enjoy room service and take-away meals in the privacy of the room. Guests can take advantage of the free newspapers provided in the lobby, go for a swim in the splash pool, and work out in the fitness centre. 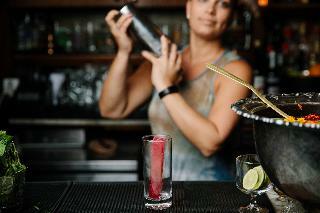 The hotel also offers a 24-hour front desk and a seasonal restaurant and bar for added convenience. If you dream of being steps away from shimmering South Beach glamour, yet cocooned in your own private haven, your wish is fulfilled in Kimpton Angler's Hotel. A Mediterranean-style courtyard with adult-only private pool, cabanas and bougainvillea set the stage for pure relaxation. Our expansive new wing serves to enhance your escapist desires. Here a warmly elegant lobby features a colossal stone doubling as a reception desk, where we greet you with fresh juice and a chilled lemon-scented towel. Our 85 glorious new guestrooms — each with private balcony are surprisingly spacious. This historic landmark is located on Millionaires Row, only minutes from South Beach's Art Deco District and the Bal Harbour shopping area. Other nearby attractions include the Seaquarium, Metro Zoo, Bayside Marketplace, Miami Convention Center and Coconut Grove. 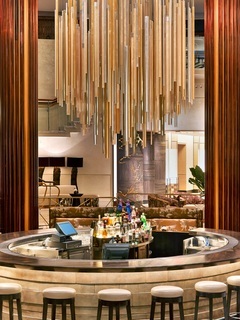 Guests check in at the beautiful all-marble lobby, where a restaurant is available for on-site dining. A daily happy hour is provided at the poolside bar and patio. The oceanfront pool features private cabanas, and visitors can stroll along the natural beach or exercise at the poolside gym. 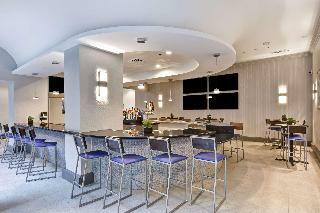 Additional amenities include room service, business amenities, laundry facilities and limousine service. Guestrooms are decorated with pale wood furniture and fabrics in muted sea tones. Accommodations include kitchenettes with refrigerators, stoves and cookware, cable television and data ports. 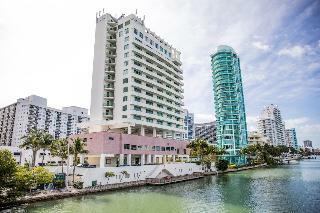 Views feature either to the ocean or the Intracoastal Waterway. 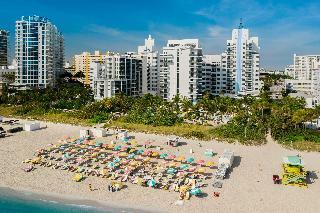 This Art Deco beachfront oasis is situated in the Mid Beach neighborhood overlooking the ocean, The Confidante Miami Beach offers a relaxed beach scene just beyond the boardwalk. Built in the 1940s, the white Art Deco tower showcases a chic mid-century modern aesthetic and modern amenities.Rooms and suites are spacious and outfitted with stylish, retro-inspired furniture and geometric print décor. All accommodations include spacious tiled bathrooms with rainfall showers. Select rooms and suites offer private balconies with ocean views.The Hotel's Restaurant Bird & Bone serves traditional American cuisine with a modern edge, while The Backyard offers light plates in an alfresco setting. Enjoy Cuban espresso and empanadas from Cafecito Bar.Lounge by one of the two outdoor heated pools or in the secluded garden. The Spa at The Confidante mixes classic and new-age therapies on the hotel's rooftop. The Customized Crystal Journey uses the crystal of your choice in a massage and gentle body-roll, followed by a crystal elixir ceremony. The spa also offers relaxation areas and a fitness center.Spend a day on the beach under an umbrella. Practice yoga on the rooftop. Tour the hotel's rotating art exhibit in the lobby. Stroll the boardwalk down to South Beach. 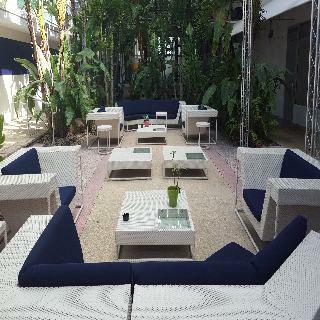 Explore the Miami Design District and Wynwood Arts District for experimental art installations, vibrant street art, and hip boutiques.Insider Tip: Indulge beachside with a handcrafted cocktail and a Confidante-exclusive popsicle called "The Confidante Pop".Early departures will be charged the full amount of original reservation. Guest must be 21 years of age to check-in. All rooms are non-smoking. Located within walking distance of the downtown Brickell Financial District, Homewood Suites by Hilton Miami Downtown/Brickell is near a variety of restaurants, bars and nightlife. You’ll enjoy easy access to I-95 and the Miami International Airport from our extended stay hotel.Tour the nearby Vizcaya Museum & Gardens, a National Historic Landmark, or take your family for a fun day at the Miami Seaquarium located on Virginia Key and nearby Key Biscayne.Unwind in a spacious studio or one-bedroom suite. Our accommodations offer seating and sleeping areas, fully equipped kitchens, complimentary internet access and sofa beds. One-bedroom suites offer separate living areas and bedrooms, and a few rooms have partial views of Miami and the Bay. Join us each morning for a complimentary hot full breakfast and enjoy dinner with drinks* after a busy day Monday through Thursday. Stock up on snacks, beverages, meals and travel essentials at the 24-hour Suite Shop®.Relax on our second floor pool deck overlooking downtown Miami, and cool down with a swim in the covered outdoor swimming pool.Both the fitness gym and business center are open 24 hours. For business or social events, our downtown Miami/Brickell hotel accommodates up to 50 guests in a meeting room offering natural lighting. *Subject to state and local laws. Must be of legal drinking age.